Dr.Sivakumaran is a young enthusiastic clinician, dedicated himself in research oriented, documented, evidence based case studies. His articles, case studies had been published in the leading journals. Here he presents a case of swelling in the vocal cord. A 72 year-old male suffering from cough since two years, then he was suffered from loss of voice since one year. He had pain in the throat since one year. Nonproductive cough < while lying down, > at night, severe burning in the throat since one year unable to swallow since three months, dryness of mouth and bitter taste in the mouth. The patient’s care givers emphasized that the patient had sleeplessness almost every night. A known case of diabetes and hypertension. 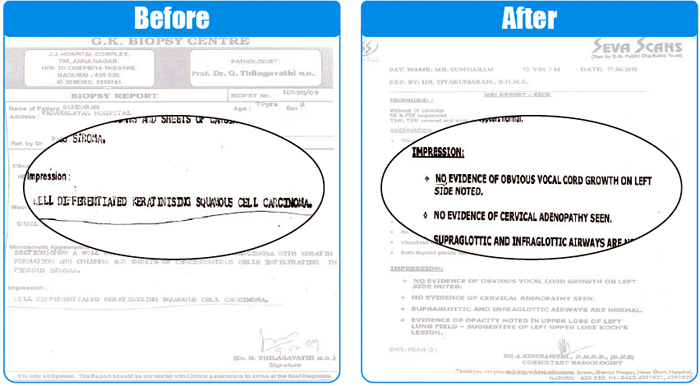 The patient also suffered from hemorrhoids and was under allopathic medication for these conditions. His father expired due to renal failure as a complication of his diabetic state. His mother died from Ca cervix. The patient is a tobacco chewer (Ganesh pogaillai) and panparak. Nonsmoker, nonalcoholic. Restlessness, anxious, extreme worry about his illness. He preferred a liquid diet due to his difficulty in swallowing solids. Thirst was increased. Had bitter taste in the tongue. Desire for hot drinks. Dry skin with itching all over. Frequent urination. Sleeplessness was severe. Thermally, chilly patient. On examination, he had difficulty in protruding his tongue due to severe pain. Tongue was coated white. The patient came to the clinic with the help of attenders, he was weak and tired. He had a dark complexion. The patient was anemic, not jaundiced. All systems were normal on examination. Haemoglobin – 12.8 mg%, blood sugar – 154 mg/dl, blood urea – 28 mg/dl, serum creatinine – 1.3 mg/dl, HBsAG – negative, HCV Ab – Nonreactive, bleeding time – 2 minutes 30 seconds, clotting time – 5 minutes 30 seconds, blood group – AB positive. Echocardiogram and routine urine exam were normal. Carcinosin 1M a single dose. During his second follow up, after careful repertorization, Arsenicum album 0/1 in 120 ml of water was prescribed. The patient reported feeling better, cough had reduced, voice production and speech had improved. Arsenicum album 0/2 in 120 ml as aqueous solution was prescribed in the same manner as described above. The patient reported no cough and his speech was clear now. The same medication was repeated. The patient reported no cough and his speech was clear now. The same medication was repeated in 0/3 potency. The patient was asked to undergo MRI - neck. The report showed no evidence of vocal cord growth on the left, no evidence of cervical lymphadenopathy. Supraglottic and infraglottic airways were normal. (Refer Plate after). Regular follow-ups were continued with Arsenicum album 0/6.